Fire Departments currently serving, and those that no longer exist as organizations, through mergers, consolidations, and annexations. We have created two menus and a page for each fire department currently serving, and those that no longer exists as an organization, such as the Belvedere Volunteer Fire Department pictured above. We will be uploading photos and information on an ongoing basis. Please note that there are some that we have little or no information on, but hope to discover information on soon. Our priority for now is the departments that no longer exist, since those currently serving may have historical information posted on their own active web sites. Please select the Departments you are interested in - use the pull down menus.. 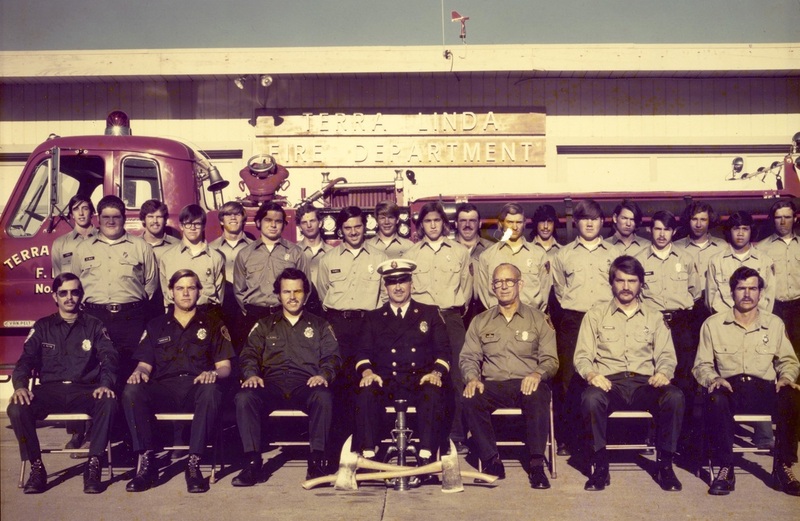 The last day of the Terra Linda FD, before the annexation into the City of San Rafael and the SRFD. Photo courtesy former volunteer firefighter and now retired Marin County FD Battalion Chief Ed Mestre, pictured seated on the far left.